As developments in home entertainment technology have made staying in a more appealing prospect, the nightlife industry has seen a decline in footfall in North America and Europe. According to the Nightlife Association, in the USA, approximately 6,500 nightclubs have either cut back their hours or closed up shop within the first year of operation. Data from the Association of Licensed Multiple Retailers shows that UK nightclubs halved in a decade, going from 3,144 in 2005 to 1,733 in 2015. Similar problems also affect other European countries: in the Netherlands, for instance, the number of clubs fell by 38 per cent between 2001 and 2011. In other parts of the world, such as Central America and Asia, enthusiasm for nightclubs is still going strong. But regardless of the wider environment, for a club to stand out and draw in a crowd – be it competing against a slew of rivals or the comfort of a living room – it’s the little extras that can go a long way. Increasingly, the quality of music and drinks on offer is not enough, as clubs are expected to provide visitors with a journey of discovery. This means nightclub designers are increasingly challenged to create something unique for their customers. 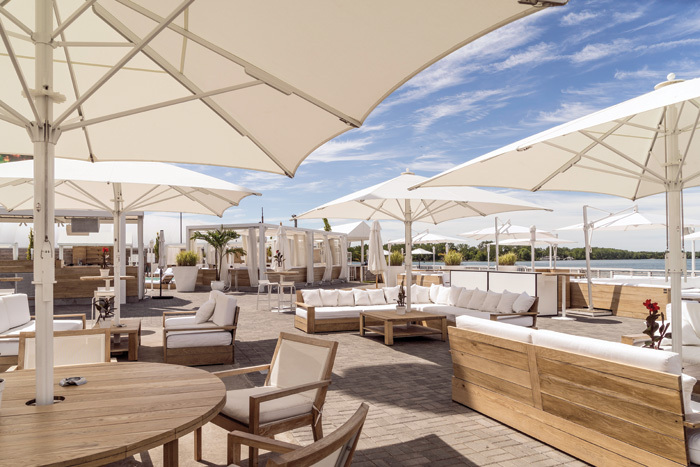 Whether it’s a straightforward design that benefits from geometric shapes and clever lighting, or a luxurious menagerie of surprises, the best new clubs around the world have a certain ‘it’ factor. In Canada, hospitality company Ink Entertainment has opened Rebel, a waterside entertainment complex in Toronto. In addition to functioning as a traditional nightclub, Rebel can also be hired as a conference space and used as a concert venue. Using the space for multiple purposes may indeed be the way forward for venues that have traditionally only come alive at nighttime. Situated in Orange County, California, the Time nightclub was designed by Davis Ink. ‘Our goal was to create a magical playground environment for adults,’ says Davis Krumins, founder and principal of the studio. 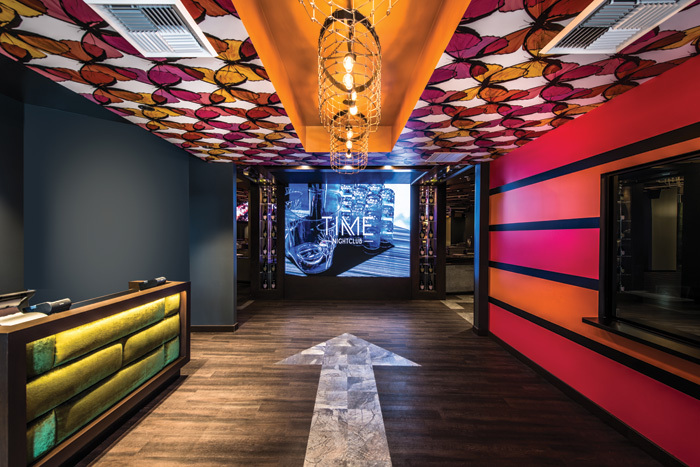 At the same time, the design team aimed to create something that would stay relevant and up-to-date for a while, resulting in a venue with a playful yet timeless look, targeting an upscale demographic of 25 to 45-year-olds. The building now home to Time was originally Niketown, a Michael Jordan-era Nike store. Davis Ink was challenged with turning what was a conservative, traditional retail space into an extraordinary venue, while making the most of the building’s architectural details. ‘We had to eliminate lots of walls, domed ceilings, huge mouldings and out-of-proportion decorative columns,’ says Krumins. The two-storey building shell consisted of three intersecting circular spaces. This enabled Davis Ink to break away from the idea of conventional rectangular dance floors and create a flowing space with no straight lines. The designers eliminated most of the interior walls to open up the space and allow views of the dance floor and stage from anywhere in the club. The two smaller circular rooms were transformed into large circular bars. The circular design without walls creates a sense of connection between the dance floor and the bar areas. The intersection of the three circular spaces allowed the design team to create an amoeba-shaped dance floor with three tiers of bottle-service tables around the perimeter. Both bars feature biomorphic elements with a twist. The main semi-circular bar area features organic-looking components, such as a boxwood-faced green soffit and snakeskin fabric panels. The ceiling above is a kaleidoscope, composed of black-and-white female silhouettes, while the floor features an Alice in Wonderland-inspired zigzag pattern. A custom-made chandelier – 28 striped, green, hat-shaped lampshades suspended with 5cm-diameter staggered rope – towers over a large semi-circular sofa mimicking the shape of the bar. Part of the wall is covered with photographic forest wallpaper with added Alice in Wonderland-style melting clocks. Stone-imitation sofas run along the walls. The back of the bar consists of large birch branches supporting backlit displays of bottles reminiscent of birdhouses. The second bar comprises honeycomb-inspired hexagonal panels: a mix of backlit bottle displays and green, silver and black upholstered panels. In the centre circle space, the second floor was removed, creating a 10m-high ceiling that lends a new sense of spaciousness to the dance floor and stage area. A large chandelier with theatrical lighting integrated into the sound system and DJ lighting fills the vertical space above the dance floor. A three-level staircase was also removed and the remaining lift-shaft wall reframed to accommodate a custom LED wall, which has become the backdrop for the stage and DJ booth. Nature-inspired touches can be seen everywhere. A zebra pattern and intricate mirrors in black frames decorate the walls of the dance floor area, lined with sofas upholstered in burgundy textiles, while custom wallpaper featuring large butterflies adorns the ceiling of the entrance and the women’s restroom lounge. 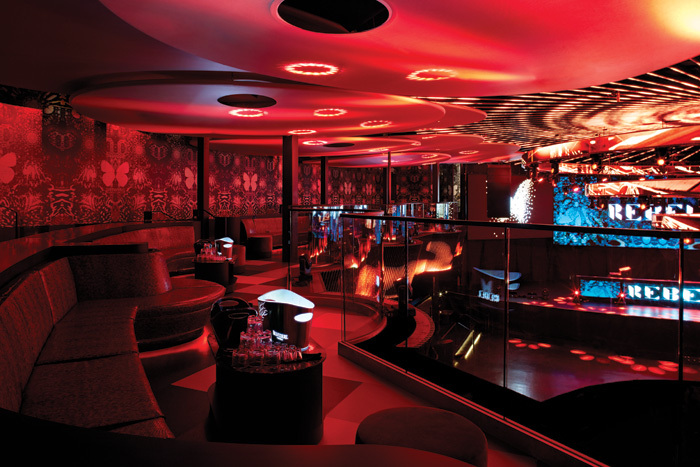 Taking over the former location of members-only nightclub Boujis, the central Hong Kong outpost of London’s now-defunct hangout for celebrities, Yojimbo aims to be a one-of-a-kind venue. Yojimbo also has distinctly more contemporary influences, including Japanese anime and street style, as well as the small underground bars of the bustling Ginza district in Tokyo. Sutton says his brief was to give the intimate venue with a late-night licence ‘a private club feel’ to attract high-end customers, while he was given a free rein creatively. 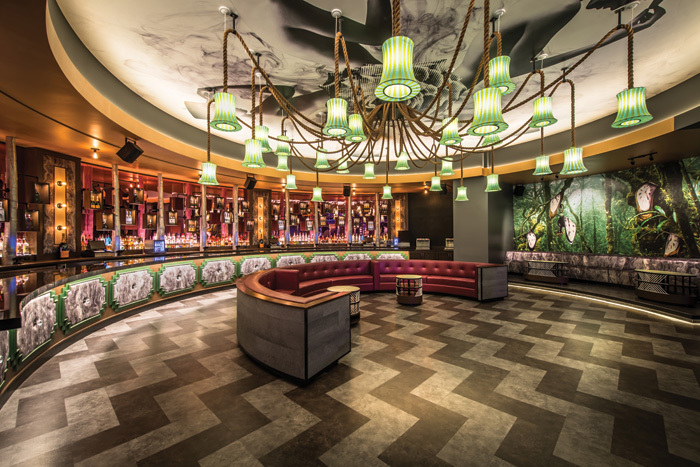 The designer has worked on several bar and club designs for the venue’s owner, Hong Kong hospitality group Dining Concepts, including Ophelia, an opulent lounge decorated with peacocks, and Iron Fairies, a bar reminiscent of an ironmonger’s workshop, based on a children’s book series written by Sutton himself. Despite its intimate setting, Yojimbo offers several environments and surprises for guests, as well as hosting a variety of avant-garde performances, featuring geishas and Harajuku punks, and boasts a Japanese-inspired cocktail menu. A quiet, minimalist lounge area has dark-grey timber walls and floors decorated with graphic off-white sunrays. Moving further into the club, an anime-inspired sunray pattern adorns the surfaces throughout. 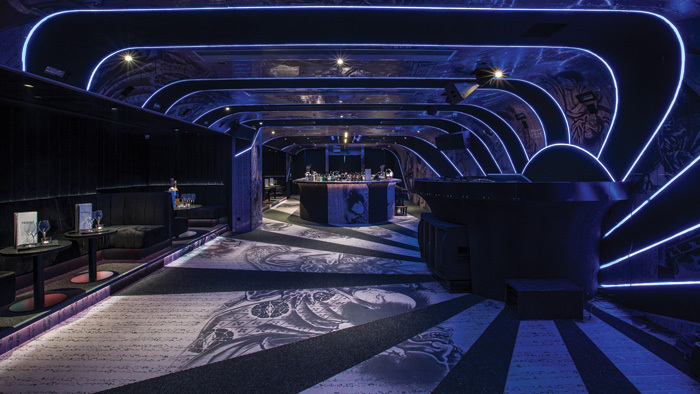 Custom-made steel panels with yakuza tattoo art graphics make up the sunray pattern on carpeting covering the floors and walls of the area surrounding the DJ booth and the bar. By the DJ booth, lighting strips taking on various colours to suit the mood border the steel panels. Outside, the club’s tiled facade is covered with the same tattoo art as the interiors, depicting armed-to-the-teeth samurai, bandits and monsters. Situated in the industrial surroundings of the Port Lands area of Toronto, overlooking Lake Ontario, Rebel is a multipurpose entertainment complex, serving as a nightclub, concert venue and event space. Formerly home to Toronto’s staple music hall The Sound Academy, the venue’s transformation was undertaken by interior design firm Studio Munge. The designers’ brief was to ‘revolutionise and revitalise’ Toronto’s nightlife by designing a full-service hospitality complex suitable for a variety of occasions, says Studio Munge principal Alessandro Munge. Besides extensive remodelling of an outdated venue, the studio was tasked with bringing the vast, 4,180 sqm space to life. Situated south-east of downtown Toronto in what is not a high-traffic area, a challenge was to attract guests to the venue and keep them intrigued throughout the night. The resulting design incorporates lush velvets, glossy, light-reflective metal finishes and graphic prints with animal motives. 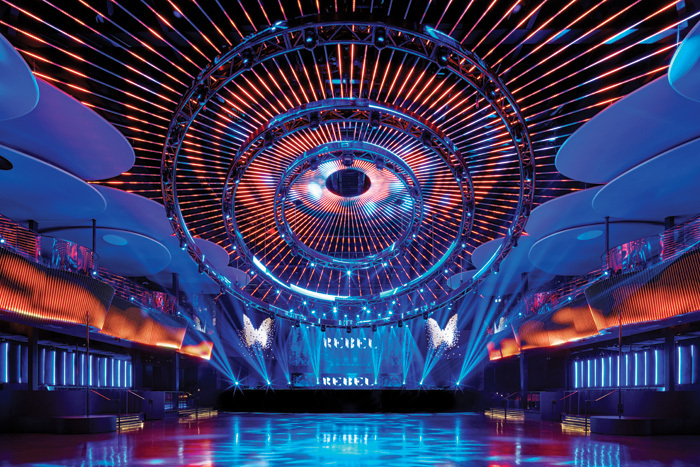 A 9.8m-wide synchronised rotating light system towers above the dance floor. With a three-tier structure, the light was designed to emulate a blossoming orchid. The mezzanine-level balconies surrounding the dance floor turn into LED walls. The seating area on the balconies has Rorscharch Test-like graphic wallpaper and sofas running along the walls provide unhindered views of the dance floor. A custom-made chandelier hangs over the entry staircase, reminiscent of a deconstructed drum kit. Fluorescent tube lighting propels from the ceiling at varying angles and heights, while mirrors reflect the chandelier into infinity. In order to create a truly multipurpose venue, the design studio had to add in adequate support systems. ‘In addition to the comfortable green room for performers, back-of-house offices, service stations and central kitchen, we created hidden features that would improve versatility,’ adds Munge. Across both floors, concealed retractable walls were designed, creating large separate rooms with potential as a club-within-a-club or hire space for private events. The designers also integrated top-of-the-line soundproofing and controlled sound systems for each area, allowing each space to function without disturbing others. 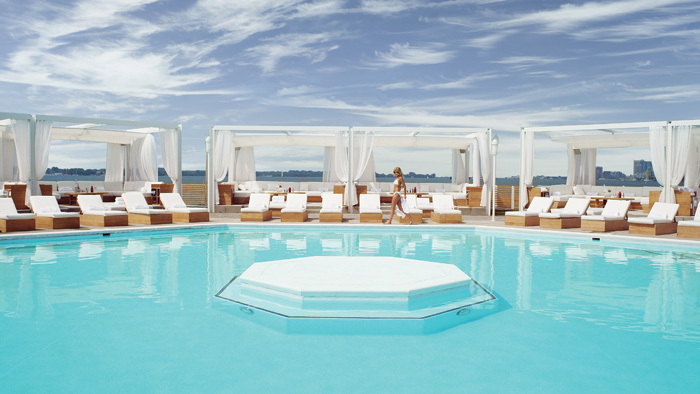 An additional feature to Rebel is the 4,645 sqm Cabana Pool Bar (above), inspired by the party resorts of Miami and southern France. The area features an octagonal pool, and white and oak day beds. 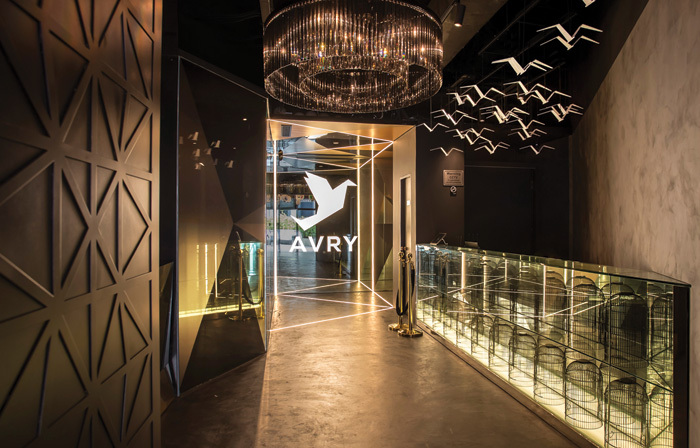 Located inside Millennia Walk, a shopping and entertainment centre in downtown Singapore, Avry is a new club with an aviary theme. Elliot James Interiors was tasked with creating an iconic design with plenty of intimate VIP areas for an upmarket, sophisticated, professional customer aged 25 and over. ‘The club needed to have a memorable and glamorous style, with various exciting and “Instagrammable” features,’ says the design consultancy’s managing director Elliot Barratt. Entry to the club is through a foyer with a large glass reception counter, occupied with uplit birdcages. Suspended above the counter are 50 white powder-coated steel birds, while an oversized Avry logo is set into triangular mirrored glass on the wall. Visitors move on to a long, mirrored corridor to the main part of the club. Floor-to-ceiling light squares make the tunnel appear narrower at the ends, while the reflection of light lends it an infinite atmosphere. The client’s brief included a smaller dance floor with a DJ booth, so the club would always seem full, with VIP booths surrounding the area. The VIP seating by the dance floor takes the form of large rose-gold birdcages on raised platforms, with feather-effect tiled steps and floors. ‘When looking at the initial style inspiration for Avry, we were keen to keep the colour palette simple and elegant, basing the design around various shades of grey and contrasting this with polished, mirrored, rose-gold metallic detailing,’ says Barratt. ‘We wanted to highlight the VIP sections with this lux, glamorous rose gold and enclose them in their own private space within the club. Through developing ideas with the client, the idea of cages and enclosures developed into birdcages and aviaries. 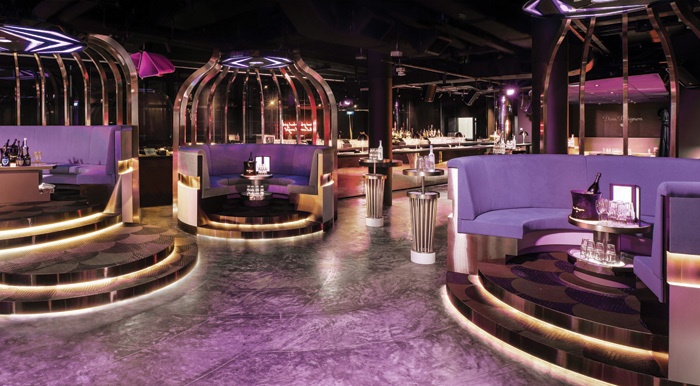 The club features a 12m-long bar with a rose-gold mirrored front, a leather armrest and tiled top. The floors throughout are mid-grey polished concrete with a chrome-patterned strip inset. Bespoke copper wall panels were designed for the curved booth in the club’s centre, and LED panels surround the dance floor walls. Elliot James also created bespoke LED ceiling panels to work in tandem with the wall panels. 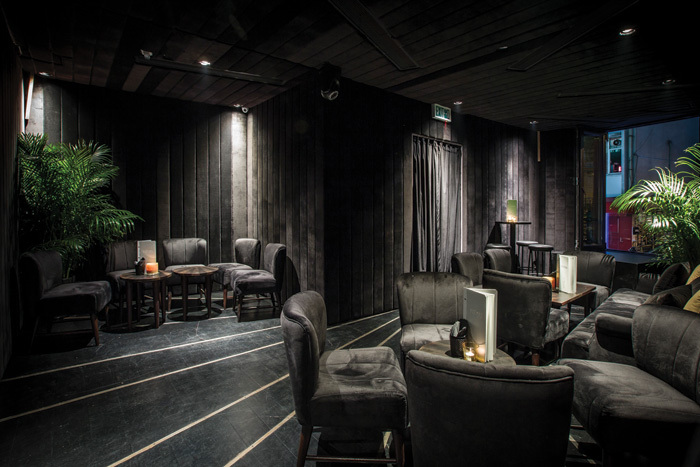 A velvet-curtained tunnel links Avry to its sister venue Hairy Canary, an all-day cocktail bar, which also features a DJ booth, bar and seating area in a similar palette. 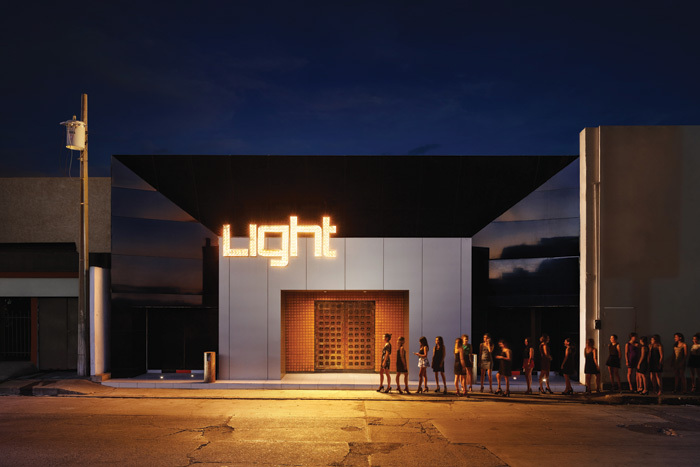 The Light Club in Hermosillo, north-west Mexico, was refurbished by architecture and interior design studio Tamen Arq. Starting with an existing design, the studio’s brief was to update the space so it would stand out as a unique venue in Hermosillo for its young, budget-conscious clientele. The studio set out to create a three-dimensional structure with lighting as a crucial element. The resulting design is a beehive-like structure in the high-ceilinged main seating area. A grid of three dimensional hexagons covers the walls, reminiscent of honeycomb. Made out of fibreboard, the hexagonal structures’ white outer rims add dramatic depth and enable the creation of various lighting effects, allowing for the hexagons ‘to dance with the music’. Integrated lighting enables different ambiences to be created to suit the music. The club’s facade is a black-and-white play on geometric volumes that appears more minimalist than the interior, with a honey-coloured main door. The entrance features a transitional space with black-and-white flooring and organically curved wooden panels. Floor-length mirrors and indirect lighting serve to create an infinite, moving corridor. In the toilet area, small point lights are used to create a ‘starry sky’ effect on the black walls. Ample bulbs with geometric wire shades, round mirrors with built-in lighting, and a mirrored wall create a bright space despite the dark surfaces of floors, walls and ceiling. The bar area is crowned by a 3m-wide chandelier with a golden shade. 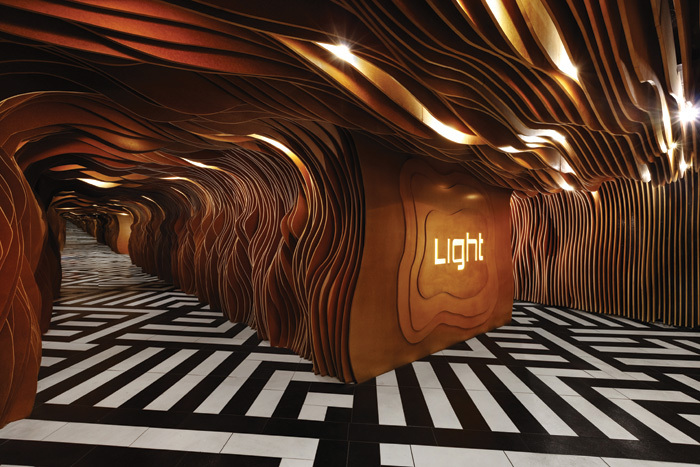 The bar itself is decorated with white and beige 3D tiles reminiscent of the club’s exterior, while a tapestry with swirling black lines on a white background creates a sense of depth and movement. 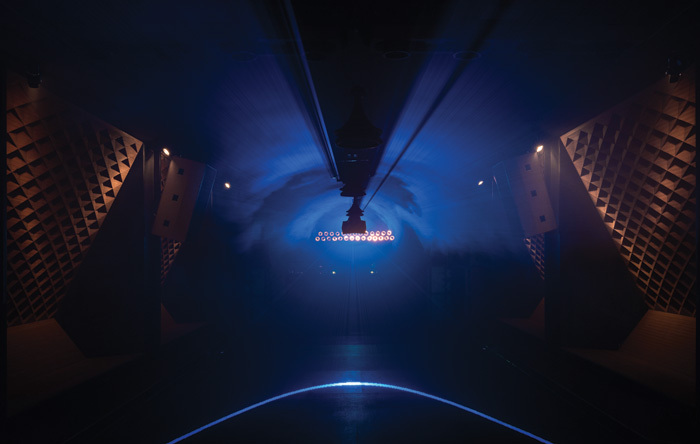 A long-term pop-up club inside Munich’s former congress centre of Deutsches Museum, under refurbishment until 2023, the Blitz Club features two dance floors and a bar area. 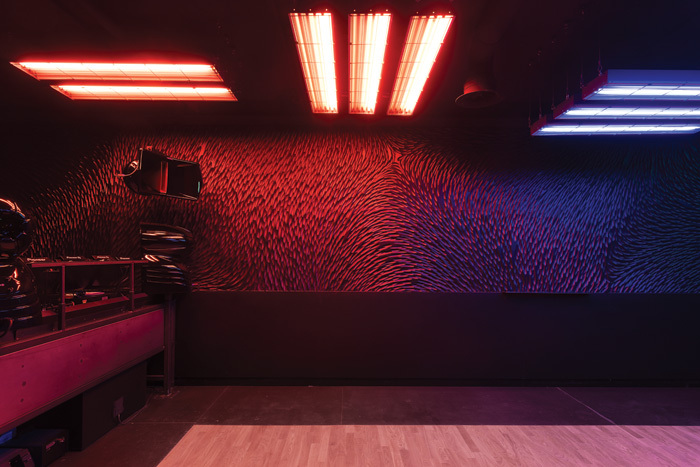 Architects Andreas Müller of Studio Knack and Simon Vorhammer designed the space, used Vorhammer’s computational design skills to first create a 3D model design of the entire club. The wood and steel main dance-floor space measures 35m x 8m, with its shape based on the layout of its historic location. 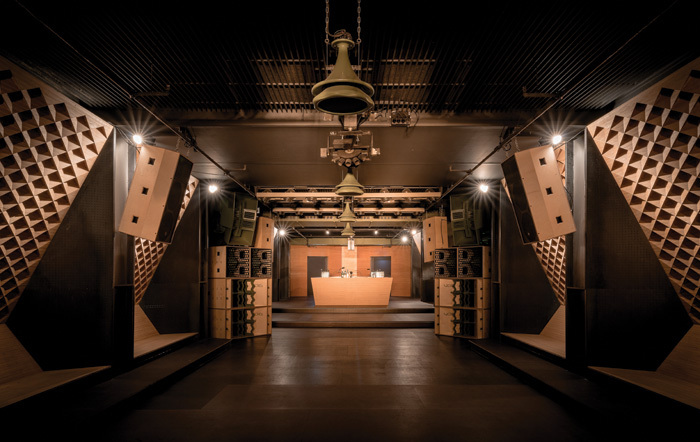 Optimising the acoustics was important for the designers who worked with an acoustic consultant, and the entire sound system was custom-engineered to suit the club. The dark ceilings, walls and pillars of the main room are offset by light-coloured laminated timber panels, which are also part of the acoustic design. The panels form ‘dance booths’, specifically optimised for electronic dance music. These wood-clad areas have inclined side and rear walls that deflect the sound in all directions, rather than reflecting it straight back. The surface of the rear walls was developed through 3D modelling. ‘Our partitions do not only look great, they also enhance the sound experience,’ explains Vorhammer. 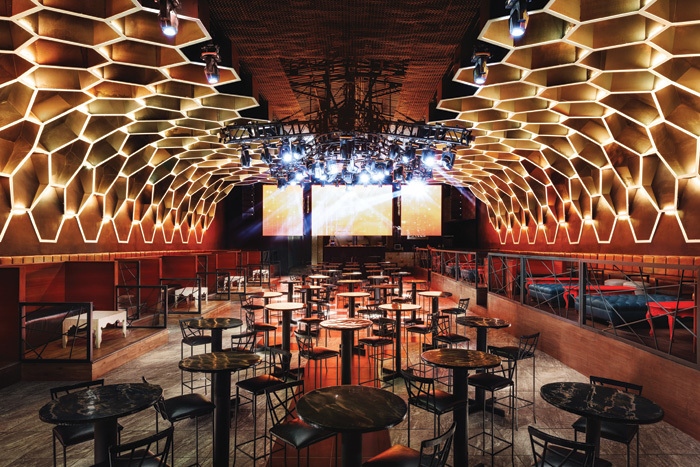 Pillars clad in thin sheet metal serve as resonators, and perforated walls in the main dance floor and bar area absorb high-pitch frequencies. For the surfaces throughout these two areas, the designers used thick trapezoid BauBuche beams, a beech laminated veneer from German manufacturer Pollmeier, creating a uniform effect. A second, smaller dance floor features darker colours and organic looking ‘flowing’ walls. The walls are decorated with a CNC-milled relief and black-coated fibreboard panels. When the club’s lights flutter over the relief, they bring it to life by creating the illusion of movement. The designers developed an algorithm to create a unique pattern of 10,000 ‘valleys’ and ‘ridges’ across 25m of the relief, inspired by the flock behaviour of fish, birds and insects.